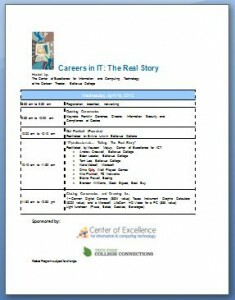 Careers in IT: The Real Story took place on April 18, 2012. It was a huge success! Please check back in May 2012 at coeforict.org for video of the keynote and panelists. Thank you. The date has been selected for Careers in IT: The Real World – Wednesday, April 18, 2012.